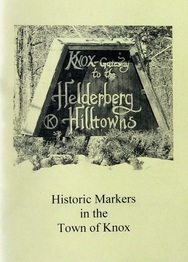 Helderberg Hilltowns by John K. Elberfeld and Jane B. McLean Part of the Images of America series, this book provides an illustrated history of the four Helderberg Hilltowns - Berne, Knox, Rensselaerville, and Westerlo. This book was written by former Knox Historical Society member, John Elberfeld and Jane McLean. ​​The price is $23.95, and includes tax and shipping. The late Dan Driscoll, Trustee of the Knox Historical Society, updated the booklet of the historic markers in Knox. Here's Dan repainting a 1932 historic marker from the State Education Department. The late Dan Driscoll spearheaded the restoration of Schoohouse #5 by the Kiwanis Club of the Helderbergs. His history of the school has vintage photos, interviews with former students, transcripts of school district minutes 1824-1905, the story of the restoration, and a foreword by local historian Jack McEneny. The schoolhouse, now on the grounds of Thacher Nature Center, is the only building in Knox in the National Register of Historic Places. Read more about the book here. Price is $15.00 donation to Knox Historical Society. Mailing, if necessary, is an additional $3.00. In May 2014, Knox Historical Society reissued the Sesquicentennial (1972) paperback history of Knox. The pages of the original edition were scanned, and the type was enlarged slightly for easier reading. When a graphic or photograph did not reproduce well, it was replaced with a similar item if possible. The original advertisers are listed at the back. The support of many new advertisers helped KHS keep the cost of the book affordable.